Vile Vinyl | Sustainable Shanti Is Now Em & El Organics! Alright, it’s been a while since I last wrote, but it’s time to get back on the proverbial blog wagon. The other night I went to a film screening of the documentary Blue Vinyl (available on Netflix), hosted by the Center for Health, Environment, & Justice at the Aperture Gallery in Chelsea, NYC. 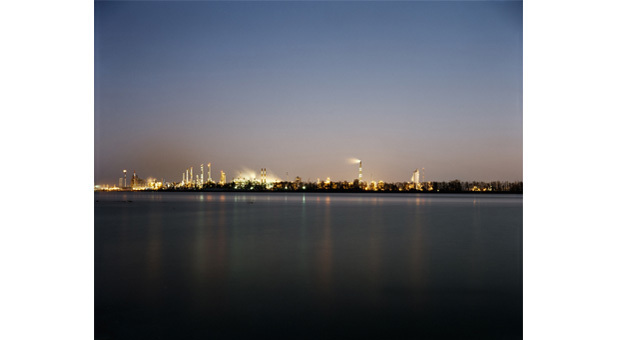 If you’re in the city, be sure to go see their current exhibit, “Petrochemical America”. As an art student in college, I was always warned about the dangers of cutting polyvinyl chloride piping (aka PVC) on the power saws because the dust can make you sick, but I had no idea just how toxic this insidious material is to our lives, to the lives of those who make it, and to the environment. And it’s EVERYWHERE! Everywhere?? Yup, everywhere. PVC, also known simply as vinyl, has permeated so many facets of our consumer culture that it seems amazing life functioned before its invention. Some of the most well-known forms of vinyl are PVC pipes, vinyl shower curtains, vinyl flooring in schools, vinyl siding for houses, children’s clothing and toys, garden hoses, disposable medical supplies and even those old vinyl records–basically any plastic with a #3 on the bottom. So let’s break down the problems with this plastic beyond “it’s toxic!” There are major problems with the material from the beginning to the end of its life cycle. The chemicals used to make vinyl are highly toxic, and scientists have shown that there are links between workers’ exposure and greatly increased risks for liver damage, bone softening and rare forms of liver cancer known as angiosarcoma. Additionally, the communities where the vinyl factories exist are being poisoned by the toxins release by the factories. Dioxin, a small family of potent carcinogens (cancer-causing chemicals), is a by-product of the manufacturing process and is released into the air. They have been linked to severe health problems including cancer, endocrine disruption (meaning they interfere with the reproductive system), endometriosis, neurological damage, birth defects and impaired child development, and finally, reproductive and immune system damage. That’s right….the people who live in the communities surrounding the factories are literally breathing in toxic air. Is the name Erin Brockovitch starting to pop up in anyone else’s head? Or is that just me? The lights of the chemical factories in Cancer Alley, a section of the Mississippi River that stretches from Baton Rouge to New Orleans, Louisiana. Photo credit: Richard Misrach. From “Petrochemical America”, Aperture Gallery, NYC. Hang in there with me: we’re far from done. To make vinyl flexible, a la the ubiquitous smelly shower curtain, additives called phthalates are added to the production line. No surprise, they are extremely toxic and carcinogenic, and are linked to severe health problems including increased asthma rates, reproductive problems in boys including decreased sperm counts and genital mutations, and cancer. Naaaasty. Heads up, ladies cause phthalates are also on the list of the top ten most dangerous chemicals in cosmetics. They are pervasive to say the least. Alright, so the factories are poisoning their communities and workers….let’s move on to what happens when vile vinyl hits you, the consumer. We have all experienced the joys of opening up a brand-new shower curtain: that smell that makes you suddenly not want to be in the room! The shower curtain is “off-gassing”, also known as the evaporation of volatile chemicals. This process can continue for many years after the initial installation, meaning that you are constantly being exposed to these chemicals in your home, your car, your schools and your office. Are we having fun yet??? Vinyl can also be dangerous to consumers if it is burned, such as in a house fire. The very innocent-looking vinyl siding suddenly becomes a toxic hazard to you and your neighbors. Think about how sick people have become from their exposure to the World Trade Center towers burning. (N.B. The people closest to me will tell you that I have strong feelings regarding discussions of September 11, 2001 and abhor its mention in most circles, but it is one of the best-known examples of the extreme dangers of burning vinyl.) We sheath our houses in materials that can potentially kill us and our neighbors. Is the convenience worth it to you? Lastly, let’s look the end-stage of vinyl’s life. Because it is not a recyclable plastic, there are only two other options for disposal: burning it in incinerators, the dangers of which I’ve already covered, and dumping it in our landfills. The latter option means that a material which is harmful throughout its life now sits for untold centuries, without degrading in a safe manner. Plastics don’t degrade in the same way that organic materials do. They photo-degrade, meaning that they break up into smaller and smaller more toxic particles, which enter our water supplies, our fish populations and ultimately, us, the animals we raise and eat, and the plants we grow and consume. Before you throw your hands up in despair, let’s look at solutions to this massive problem. Life did exist and function quite well before vinyl came onto the market. First of all, avoid buying it wherever and whenever you can! 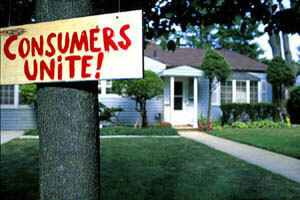 Be an aware consumer. Building a new house or building? Find out what’s in those building materials. Don’t buy PVC piping–use copper or HDPE pipes. The Center for Health, Environment & Justice have many resources to get started in learning about their campaign to remove PVC from our lives. You can check it out HERE. They are currently working to get the New York City Public Schools to go vinyl-free in their buying habits and are happy to answer questions. I’ll leave you with this ultimate question when it comes to any toxic material: what is it worth to you? By buying and using products made from vinyl, we are making a moral decision on whose life is worth more. Are you willing to buy a product that you now know harms those who make it in order to have a more convenient or less expensive lifestyle? Making environmentally-friendly choices involves being aware that there are other peoples’ lives at stake in this world and in the future. What are they worth? This entry was posted in Uncategorized and tagged choices, environment, toxic, vinyl by sustainableshanti. Bookmark the permalink.